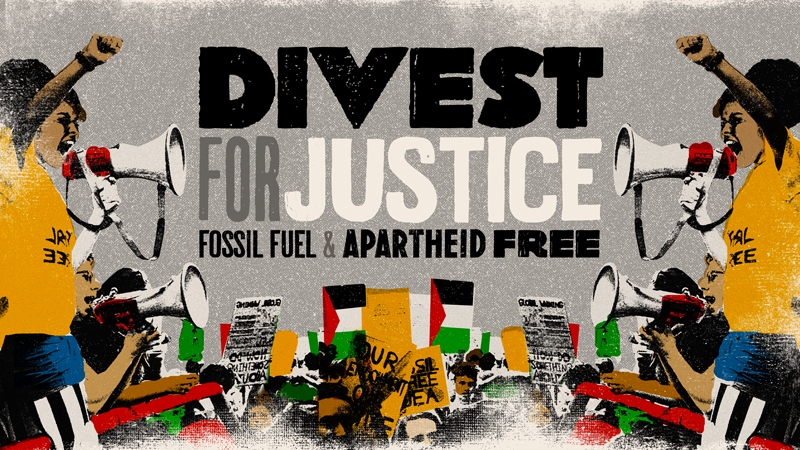 Palestine Solidarity Campaign and People & Planet are teaming up for the first divest for justice student conference! Can you add a donation to help us cover costs? Join us for an opportunity to gain key tools and techniques to build powerful divestment campaigns to end your university’s investments in wrecking the climate, Israeli apartheid and the arms industry. Israel’s system of unjust power continues to intensify, and life for Palestinians under occupation is reaching breaking point. Israel’s nation state law officially embeds into the constitution its system of laws and policies that discriminate against Palestinian citizens of Israel, illegal settlement expansion continues to swallow up Palestinian land in the West Bank and East Jerusalem, and Palestinians in Gaza remain under a crippling siege. Since March Israel has responded with live fire to protesters in Gaza demonstrating against the siege and asserting their right to return to the lands from which they were expelled in 1948 and 1967, killing over 250 and maiming more than 26000. Despite all of this Israel continues to receive financial support from governments like Britain’s, and from our own institutions and universities. Climate change is already having massive effects on some of the most vulnerable people on the planet. No one wants to flee their home because of famine or conflict caused by extreme weather. Yet since 2008, climate-related disasters displaced 22 million people yearly across the world. Communities on the frontline of fossil fuel extraction are also seeing their land and ways of living destroyed. Indigenous communities across the globe are resisting the expansion of extraction projects across the world and we support their struggle. UK universities continue to invest 100’s of £millions to facilitate and profit from wrecking the climate, Israeli apartheid and the arms industry, despite many holding “ethical investment policies”. This event will provide an opportunity for students fighting back and striving for divestment on their campus across the UK to come together, skill up, meet and learn from one another, with workshops covering: creative action, time-lining an effective campaign, using the media as a campaign tool and more. Universities have a public responsibility to clean up their investments. They should be setting the precedent for wider society to follow, divesting for justice is imperative to the liberation of all people and the just world we’d like to see. Join us in our united movement for freedom, justice and equality to create a better world that respects the rights of all. Please use the booking form below to register your place as soon as possible to avoid disappointment.